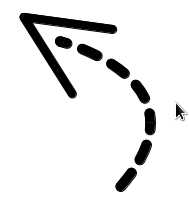 Image showing rounded line-caps on a pair of poly-lines. CC0 etc. screenshot created by me. current 2012-12-19T12:17:23 189 × 203 (7 KB) Mmeeks (talk | contribs) Image showing rounded line-caps on a pair of poly-lines. This page was last edited 12:17:23, 2012-12-19 by Michael Meeks.